We’ve served this every fall for gatherings with family and friends. I actually am not fond of pumpkin pie, but this far surpases pie, is far simpler to make and everyone loves it! I imagined this tradition continuing as Krista created a home wherever she lived throughout the world, even Bolivia. The waft of cinnamon and nutmeg brings the kitchen alive. Try this…..guaranteed great for crowds and still delicious on day two or three…but it rarely lasts that long. Prepare a 9×13 pan, sprayed with oil/flour baking spray, or butter and flour pan. Preheat over to 350 degrees. Mix first 7 ingrediants for 2 or 3 minutes. Pour into prepared pan. In a large bowl, add cake mix and one cube butter sliced into thin pieces. Cut butter into mix until small crumbles form. Evenly distribute this on the top of the pumpkin in the pan, slightly patting down with a spatula. Grate a small amount of fresh nutmeg across the top. Bake between 45-55 minutes, checking until pumpkin appears set when a toothpick or knife comes out clean. Let rest for a few minutes. Serve with whipped cream or ice cream….listen for the raves! During times of loss, somehow familiar foods give a quiet comfort for families. I have found my love of cooking continues to offer a creative joy to many a day, so now and then I’ll include some soul-satisfying recipes in this blog. We’re delighted to be in stormy Boston now for Thanksgiving with our daughter Susan’s family with our grandson Hunter and granddaughter Quinlen, adopted from Viet Nam. Thinking of each of you as you gather with those you love, both those present at the table and those alive in your hearts forever. Thank you so much for joing the pilgrimage and sharing your stories. I’m grateful for you! Do you have favorite comfort foods and recipes you’d like to share? Setting the family table for Thanksgiving gives a painful reminder of losing ones we love. Empty places… once exuberant with life. Especially during the early years after a death, holiday celebrations take intentional planning because our hearts pulse with grief. But Thanksgiving is unique because it’s very nature calls us to be thankful during loss. After the harsh 65-day ocean crossing in the Mayflower and the brutal winter of their early settlement in Plymouth, the Pilgrims had lost nearly half of their 102 members to disease and death. 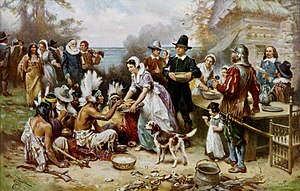 Yet, even grieving the 49 losses in their beloved community, they still celebrated in 1621 when their harvest came in and added abundant venison, cod, bass, and turkey. The remnant looked to the future with hope. So did the New Orleans families celebrating after Katrina in the picture above where their decorations related to life after the disaster, including an MRE package, cans of water, battery and cel-phone. Even the Phillipine parishioners gave thanks in recent Sunday church gatherings after their devastating losses. Each have discovered that digging deep for gratitude becomes a tool for resilience. But it’s not easy. A friend told me of one defiant and truthful mother who told a counselor, “I don’t want to find blessings in a broken heart.” She may have been responding to friends trying to comfort her with the panacea of”counting one’s blessings” too early after a death, before she engaged in grief work. But ultimately, the pilgrims clearly were on to something. Parents tell me they only entered peace and acceptance when they could eventually remember with thankfulness all the child meant in their life. There’s a small book of poetry by Dom Helder Camara called A Thousand Reasons for Living that has been a companion during the years following our daughter’s death. An archbishop in Brazil, he was twice nominated for the Nobel Peace Prize for his work with the poor. He’d often rise at 2 a.m. to write brief meditation/poems that his friends collected into small books. His poetry, alive with awe at the wonders received if we stay open to each day, reminds me to stay both present and hopeful during difficult seasons. I’ve written earlier about the healing power of nature and Helder Camara speaks to this too. Have you found it’s possible to have gratitude amidst grief?